Today I had to change the settings on this blog to disallow comments unless you are registered for this blog. I had it open to all registered users and it seems that you get comments that have absolutely no meaning, just people linking to their get rich quick and enlarge your anatomy sites. This seems to be the ongoing problem with the world. Here I am honestly trying to make the absolute best software possible for a reasonable price and the rest of the world is making a killing hawking snake oil. I keep wondering if I'm making a mistake? I keep wondering if I should be hawking something worthless and just working on people's ego? I know I'm not the best marketeer, but I am a good developer of product. I know that if I can just continue to make the best software, and continue to improve my marketing programs that this will be a bigger success. 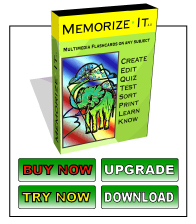 I say bigger success, because I already have people that tell me this flashcard software really worked for them and got them through high-school and college. That to me is the measure of success, that I actually made a difference in someone's life. I didn't make a killing on my software, I charged a reasonable price. I didn't lie to sell it to someone who really didn't need it, I just made something that really worked for me. Who knows where I'm going with this. I'm just tired of all the snake oil. If you want to post comments here, just ask. I'll add you to the list without question as long as you agree to post on topic. And that topic is flashcards.